Mercedes-Benz Fashion Week Australia (MBFWA) may be done and dusted for 2017, but it will continue to inspire us for months to come. In particular, the trends spotted on the streets outside the shows will influence wardrobes and outfits this winter. So, if you want to have a stylish season, you need not look further than Sydney for inspiration. From bright pops of yellow and contrasting monochromatic looks to the new must-have shoes and statement sleeves, these are the top trends seen at MBFWA ’17. Invest in them now, and your closet will keep you chic throughout every cold day this year. This MBFWA was filled with bursts of sunshine, and we’re not talking about the weather. 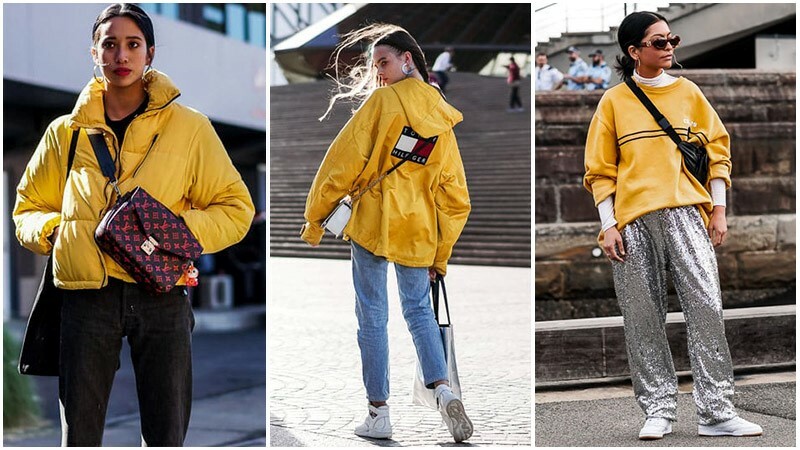 When in need of a pop of colour this season, the street style set turned to yellow for help. The bright hue accented many stylish outfits with a playful touch, catching everyone’s attention in the process. Happy, vibrant, and fun, the colour was an unexpected departure from the neutral and moody tones typically spotted during this time of the year. Of course, the bold hue demanded balance and, as such, appeared best when restricted to a single, statement garment. A pop of yellow can be an excellent way to inject your outfits with some energy and life this season. 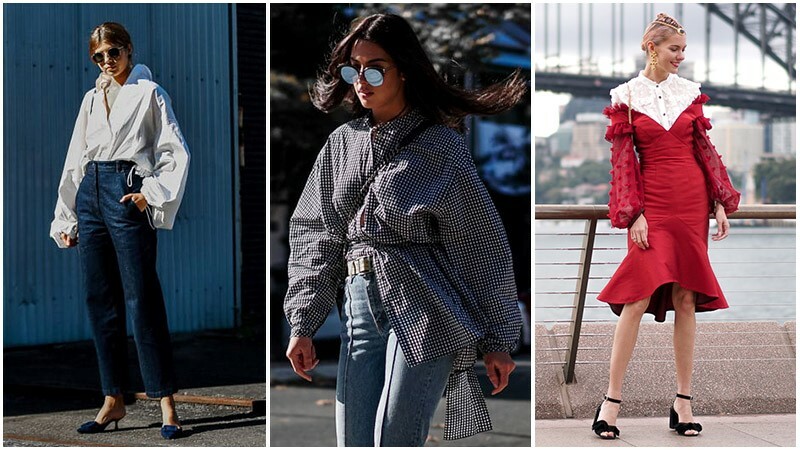 All you need to do to nail the look is to take cues from the stylish ladies at MBFWA who rocked it. 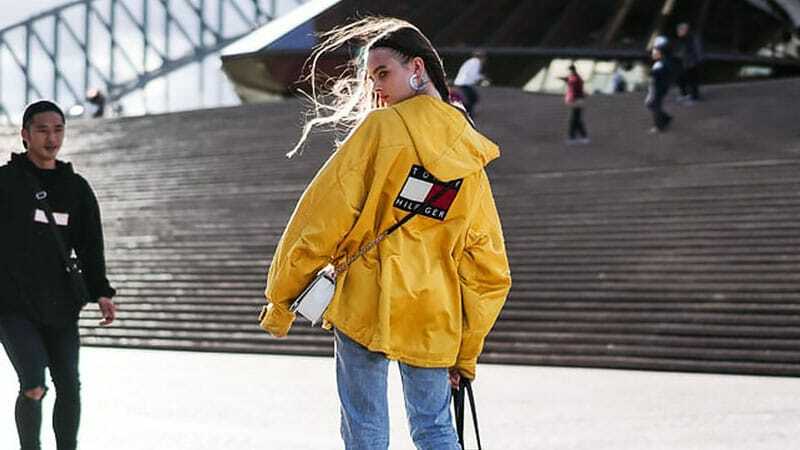 Instead of opting for dresses, skirts, pants or tops in yellow, follow their lead and focus on jumpers, jackets, and coats. The invigorating hue will make these pieces stand out even more than usual and become the focus of your outfit. Just remember to keep the style minimal, such as a simple raincoat or puffer jacket, to avoid detracting attention for the sunny shade. Likewise, the rest of your outfit should be rather casual and understated. A pair of jeans, a long-sleeve T-shirt, sneakers, and a cross-body bag will all work perfectly well. While blazers and leather jackets will always have a place in our wardrobes, it’s all about the bomber right now. The military style jacket has cemented itself as a must-have piece over the past few seasons and it continues to be one of the most popular outerwear choices. 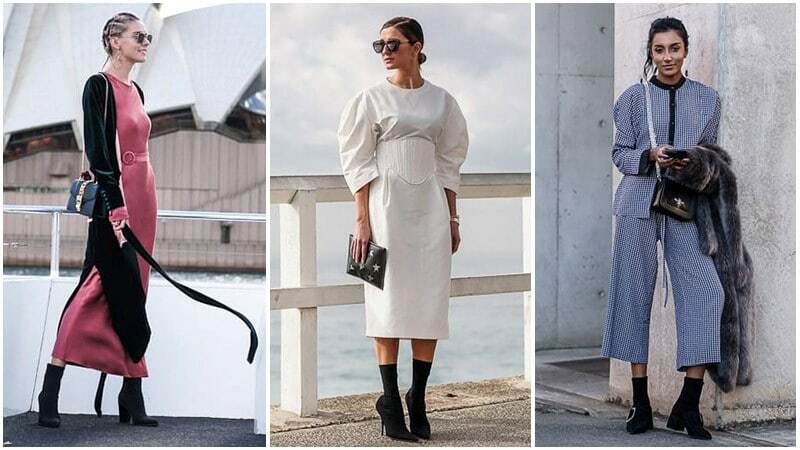 This season, the style shone again with many ladies hitting the streets outside of MBFWA in the garment. Of course, they weren’t the same old plain bomber jackets that we’ve seen a hundred times. These bombers featured statement details that elevated their look and intensified their fashionability. By investing in a bomber jacket with statement details, you can look just as chic as Sydney’s top street style stars all season long. All you need to do is select the perfect one for you. To do so, choose between styles with eye-catching details, such as embroidery, patches, studs or contrasting colours. For an excellent on-trend look, you should also keep an eye out for bombers with lace-up details. The unexpected element is completely chic and a great alternative to colourful and bold embellishments. Then, once you have found your perfect bomber, rock it all season long. You can wear it with anything from jeans and boots to a dress and heels, as long as the colour suits. If there was any doubt that the sock bootie was fashion’s favourite new footwear trend, MBFWA put it to rest. The chic shoe was out in force at Fashion Week and looking incredibly stylish the whole time. If you’re yet to familiarise yourself with the footwear style, a sock bootie is a hybrid that combines an ankle boot with a sock. The result is a tight-fitting, stylish boot that clings to the ankle for a super slim and flattering appearance. Sock booties are the perfect boot for winter and are ideal for evenings out. As well as being incredibly chic and flattering, these boots are also comfortable and will keep your feet warm. Rock them to your next cocktail night, and you won’t be sorry. Just remember that these shoes are meant to be shown off, so don’t cover them with long designs. Instead, pair them with a mid-length dress or cropped pants. The small flash of skin at your shins will balance the look and help define your stylish sock booties. Also, keep your silhouette a little loose on top to complement the ultra-slim look of these shoes. The bishop sleeve may be hundreds of years old, but it fit in perfectly at MBFWA 2017. The sleeve, which balloons out towards the wrist before gathering in a cuff, was spotted on dresses, shirts, and tops throughout the week. Voluminous and statement-making, the style was an unmissable outfit feature that worked well with both daring designs and more understated styles. Like the bell sleeves of 2016, bishop sleeves are a fun fashion trend that can be worn by anyone. They can also suit a range of looks, including casual, formal and sometimes even office attire. As such, investing in this versatile trend is seriously worthwhile. To get the most out of your bishop sleeves, just select a shirt in a neutral hue. By doing so, you’ll be able to wear your new, on-trend top with anything from jeans or pants to a skirt or slip dress. Minimalism is far from dead, and while pops of yellow were popular at this year’s MBFWA, so too were monochromes. 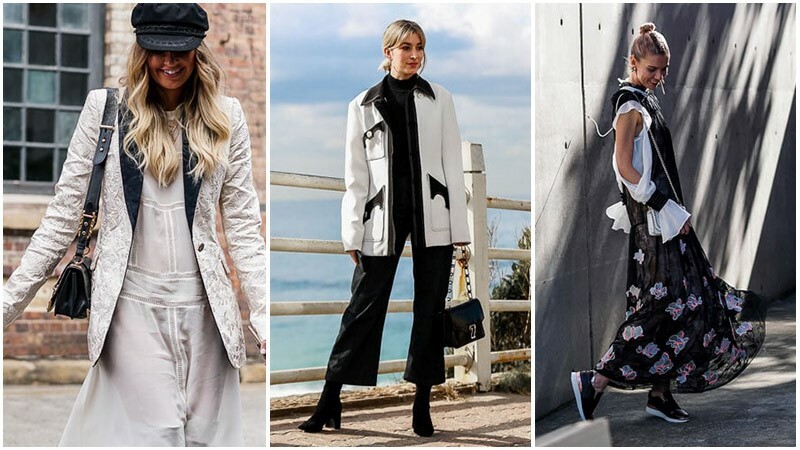 The trend took things back to basics on the streets of Sydney last week, favouring simple shades of black and white over anything else. While the look could have been achieved by pairing white garments with black, the street style set preferred pieces that contained both shades. Whether it was a white blazer with a black lapel or a black dress with white shirt, the monochromatic designs appeared sophisticated and chic. While anyone can rock head-to-toe black and white, doing so in style requires some thought. Instead of just picking any pieces that combine the dark and light shade, look for ones that convey a particular style. If you favour a feminine and classic aesthetic, you should try opting for a lace design with a contrasting trim. But, if you prefer a contemporary appearance, you should consider designs with a sharp silhouette and a more striking contrast.